Routing metrics help calculate optimal path from source node to destination node; it is the key for the whole network performances and needs to be carefully designed. Existing routing metrics independently describe intra-flow interference and inter-flow interference, so measures should be taken to make the component that describes the intra-flow interference around the same value range as that describes the inter-flow interference. These measures will complicate the design of routing metrics or introduce adjustable parameters, but how to adjust the parameters based on network status is still a challenge. In this paper, we propose an isotonic routing metric, called MIL (metric based on uniform description of interference and load), which uniformly describes factors including physical interference, logical intra-flow and inter-flow interference, and node load. MIL can detect and avoid heavy load and heavy interference areas in the network, and it can guide packets to reach destinations with low end-to-end delay. As byproduct, a channel diversity expression is also proposed to reflect channel distribution along paths. Simulations show that MIL outperforms some existing well-known routing metrics. Wireless mesh networks (WMNs), which can extend the coverage of current wireless networks, draw close attention from academic community and industry in recent years, and they are envisioned as the economically viable networking paradigms to build up broadband networks [1, 2]. WMNs are composed of three types of nodes: mesh clients, mesh routers, and gateway nodes , as shown in Figure 1. Mesh clients are user equipment, such as PC and mobile phone. 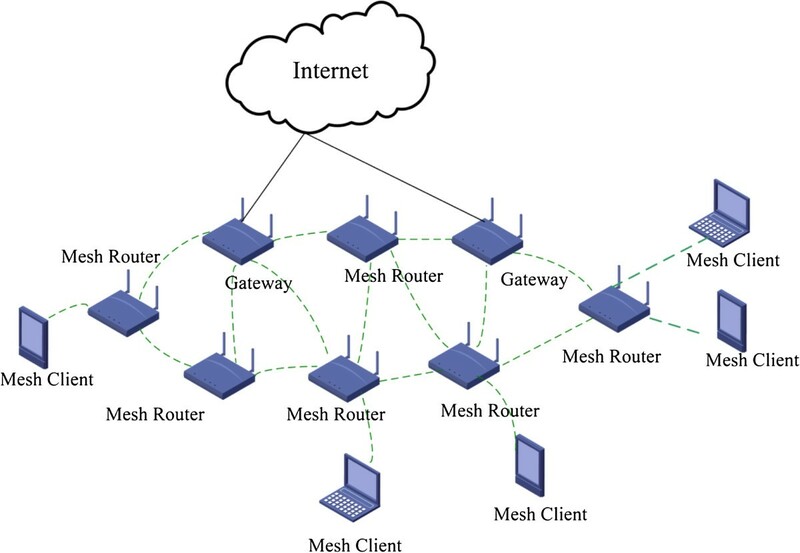 Mesh routers, which consist of access and relay function, form the mesh backbone and connect mesh clients with the gateway nodes. Gateway nodes are special kind of mesh routers with the function of bridging, and they connect the whole mesh networks with external networks, such as the Internet. One of the problems that need to be solved in WMNs is the limited network capacity due to the interference among links that transmit simultaneously. Radio resource allocation can be utilized to mitigate interference [5, 6], but the most commonly used approach to mitigate interference is multi-radio multi-channel (MRMC). It allows each mesh router to be equipped with multiple radio interfaces, and it also allows the networks to use multiple channels, so that different radio interfaces on the same node can be tuned to different channels and perform parallel transmissions or transmit and receive simultaneously . Routing helps provide guaranteed quality of service (QoS) in networks [8, 9]. Routing protocols calculate optimal path from a source to a destination [10, 11]. One main component of a routing protocol is its routing metric that determines the quality of different routes . Therefore the designing functionality of proper routing metric has great influence on the performances of the whole networks. Routing metrics for WMNs have been proposed in the past few years [13–22], in which intra-flow interference and inter-flow interference are described independently, so measures should be taken to make the component that describes the intra-flow interference around the same value range as that describes the inter-flow interference. These measures will complicate the design of routing metrics or introduce adjustable parameters, but how to adjust the parameters based on network status is still a challenge. Physical interference should also be included, since it measures interference by signal strength. Isotonicity is another requirement for routing metrics, since it is a necessary and sufficient condition for Bellman-Ford and Dijkstra’s algorithm to find minimum weight path and loop-free forwarding. We propose an isotonic routing metric based on uniform description of interference and load, called MIL (metric based on uniform description of interference and load), in which equivalent bandwidth is utilized to describe logical inter-flow interference, intra-flow interference, and physical interference uniformly. MIL can capture the characteristics of WMNs comprehensively and help find good quality paths to route data flows. A new channel diversity expression is also proposed to reflect the accurate channel distribution along paths. This paper is organized as follows: In the ‘Related work’ section, we review the previous work on routing metrics in WMNs and highlight the limitations of these metrics. The ‘MIL routing metric’ section provides our MIL routing metric and the channel diversity expression. The ‘Performance evaluation and analysis’ section presents the evaluation of the proposed MIL routing metric using network simulator (NS-2); MIL is shown to outperform some existing well-known routing metrics at the end. Our conclusions are presented in the last section. Hop count  is the most commonly used routing metric in multi-hop wireless networks , and the path with minimum hop count is usually chosen for routing packets. However, hop count considers nothing about the differences of transmission rates and lossy links. In fact, transmission failures may happen because the quality of wireless link is affected by many factors like collisions and noise . Hence, its performance may not always be good. Excepted transmission count (ETX)  and expected transmission time (ETT)  are basic components for several other routing metrics. They both use probing packets to acquire delivery ratio which introduce overhead to the networks. In addition, ETX and ETT do not explicitly consider the effects of intra-flow and inter-flow interference. Weighted cumulative expected transmission time (WCETT)  extends ETT by including channel diversity in MRMC scenarios, but channel diversity only reflects intra-flow interference, with lack of consideration of inter-flow interference. where 0 ≤ w1 < w2, CH(i) is the channel used to transmit to its next hop by node i and CH(prev(i)) is the channel used in the previous hop of node i. If two consecutive nodes use the same channel, CSC is set to a large value w2; otherwise, CSC is set to a small value w1. The value of w2 can vary from 0.5 to 5 according to network status. where N is the number of nodes in the network and min(ETT) is the smallest ETT in the network. α is used to make IRU component around the same range as settings of CSC. The introduction of α is a disadvantage of independent description of intra-flow and inter-flow interference. Also, the throughput of the whole networks is affected by the value of w2, though not heavily. Routing metrics proposed in [17, 18] also use CSC to describe intra-flow interference, so again intra-flow interference and inter-flow interference are described independently. Thus, these metrics have common limitations with MIC. where L j is the packet size of link j; it is set to the same value for all packets in the network, such as 512 bytes. R j is the data rate of link j. N l is the set of links whose transmission can interfere with the transmission on link l, and N l includes link l. In fact, CATT l measures the number of interfering neighbors of link l.
where r j is the data rate of link j; it is set to the same value for all links in the network. ETT l is the expected transmission time of link l. N l is the set of interfering links. INX can be regarded as the extended version of CATT which considers the expected transmission time of the interfered link. CATT, INX, and MIC routing metrics are proposed on the basis of protocol interference model, which uses the concept of transmission range and interference range. However, protocol interference model leaves the effect of physical signal power on successful reception of a packet out of consideration. Definition. Assuming for any path a, its metric is defined by a metric function W(a) and the concatenation of two paths a and b is denoted by a + b, the metric function W (·) is isotonic if W(a) ≤ W (b) implies both W (a + c) ≤ W (b + c) and W(c′+ a) ≤ W(c′+ b), for all a, b, c, c′ (see Figure 2 below for details). We can see from the figure that for paths a and b, if W (a) ≤ W (b), no matter we add any path before or after them, the relationship between the whole paths will not change, that is, from W (a) ≤ W (b), we can get W (a + c) ≤ W (b + c) and W (c′+ a) ≤ W (c′+ b). Then, we say metric W (·) is isotonic. Isotonicity. This property ensures that routing protocol can find minimum weight and loop-free paths. Uniform description of interference. Interference mentioned here includes physical interference, logical intra-flow interference, and inter-flow interference. Uniform description of interference can help avoid complicated design of routing metric or introduction of adjustable parameters to weigh different components. How to adjust the parameters based on real network status is still a challenge. Load-balancing and interference-aware property. Load balancing capability helps avoid the creation of bottleneck nodes and congestion, and interference-aware capability helps avoid heavy interference areas, so packets can be transmitted accurately. Passive monitoring. This helps acquire measurements without introducing extra overhead into the networks and disturbing the normal operation of the networks. where N is the total hop length of path p, and N1 and N2 are the number of hops taken on channel 1 and channel 2, respectively. Equation 7 restricts the number of available channels in the whole networks to 2 and considers nothing about inter-flow interference. As shown in Figure 3, path a and path b are both 4-hop paths, but with different channel distribution. Path a takes three consecutive hops on channel 2; the transmission on these hops cannot be active simultaneously. The maximum number of consecutive hops taken on the same channel in path b is 2; it is obvious that path b is better than path a. As CDI values for path a and path b are both 0.25, CDI is not a proper metric of measuring channel diversity. Channel diversity for 4-hop paths. where MRAB is multi-radio available bandwidth which is iteratively calculated under intra-flow interference and inter-flow interference. BSig denotes the achievable bandwidth of path p with single channel, i.e., it is the estimate minimum bandwidth if all links of the path work on the same channel. Higher CDC means better channel diversity. For convenience of comparison, intra-flow interference is considered only. Suppose the interference range is 2 hops, nominal data rate is 2 Mbps; thus, CDC values for path a and path b in Figure 3 are 1 and 1.5, respectively, and path b is better than path a. We can claim the conclusions that CDC can describe the channel distribution along above 4-hop paths. For paths shown in Figure 4, CDC values are both 1, but it is obvious that path d is better than path c.
Channel diversity for 9-hop paths. As in the analysis above, CDI and CDC both cannot accurately describe the channel distribution along various paths, so a new quantity which can describe the real distribution along paths is still in need. In this section, we develop an isotonic routing metric based on uniform description of interference and load. Equivalent bandwidth is utilized to describe logical inter-flow interference, intra-flow interference, and physical interference uniformly. MIL also takes load information into consideration to help avoid routing packets into heavy load areas. A byproduct of MIL is channel diversity expression (CDE), which quantifies the channel distribution along a path. Consider MRMC WMNs, where each node is equipped with multiple radio interfaces. Each radio interface is pre-configured to a certain channel; there is no channel switching. Radios configured to different channels do not interfere with each other; they can be active simultaneously. Radios belonging to the same node are configured to different channels. where N denotes the received background noise power, P u (v) denotes the received signal power at node u from node v, and P u (q) denotes the interference power from a different transmitting node q.
where TotalTime is the entire monitoring time and IdleTime is the time when no data keeps the channel busy. Analysis in  shows that CBT is the most precise means of measuring the utilization of channels in wireless networks, which can be acquired by passive monitoring, without introducing overhead into the networks. CBT can measure logical interference more accurately than other measures. where SINR i is the signal-to-interference-plus-noise ratio and SNR i is the signal-to-noise ratio. where b i and b j are the available bandwidth of links i and j, respectively. If equivalent bandwidth above is directly used in the routing metric, just as the case in , it may result in non-isotonic property. From Equation 18, we can see that four cases may happen in the calculation of link k’s equivalent bandwidth. In the first case, B k has nothing to do with link j or link i, because they use different channels. 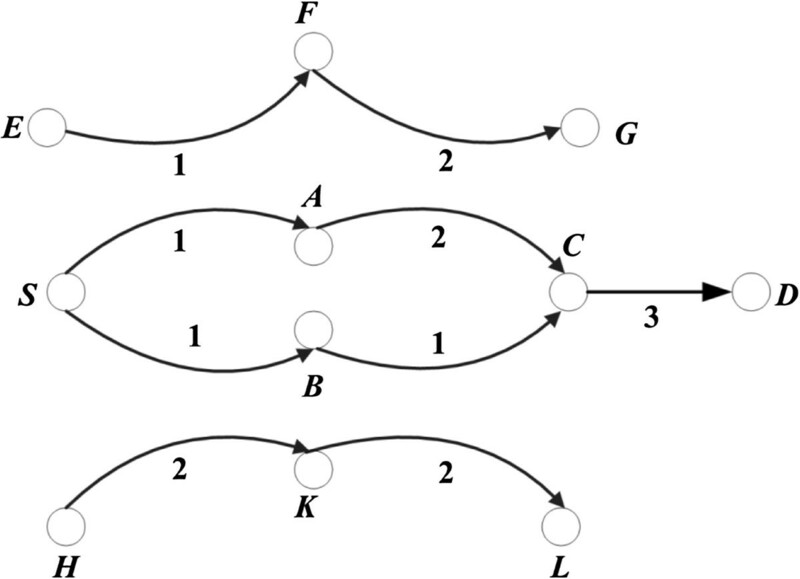 In the second and third cases, B k is only related to one previous link, link i or j. In the last case, B k is related to both links j and i. Of course, in all four cases, B k is also affected by inter-flow interference and physical interference. where θ is the moving exponent. MIL is an isotonic metric which takes load and various interference into consideration, and it can detect heavy load and heavy interference areas in the network and guide packets to bypass these areas. As intra-flow interference exists between links that are within 2 hops, transmission on link k may interfere with that on its previous link j and link j’s previous link i, so we define equivalent bandwidth which can be calculated from Equations 12, 17, or 18. The expression of equivalent bandwidth is similar as CSC in ; the only difference is that CSC equals to w2, w3, w2+w3 or w1 which are constant, and the value of our equivalent bandwidth is not constant. Thus, we use the same virtual network method in  to achieve isotonicity. As the combination of channel assignments for precedent links within 2 hops is finite, it is possible to introduce virtual nodes to represent all channel assignment states. By doing this, routing metric can be translated into isotonic weight assignment to the virtual links. Since the routing metric of a path is the same as the aggregated link weight of the corresponding virtual links and the weight assignments of the virtual links are isotonic, efficient algorithms can find minimum weight paths. More details can be found in (, Section 6). where Bbas is the nominal link data rate and B k denotes the equivalent bandwidth of link k on path p calculated from Equations 12, 17, or 18. Higher CDE means that channel distribution is more uniform, and interference is lower. Suppose the interference range is 2 hops, nominal data rate is 2 Mbps, CDE value for path c in Figure 4 is 5.5, and CDE value for path d is 6.17, so CDE can describe the actual channel diversity. Channel diversity analysis under inter-flow interference. From the calculation results, we can see path S → B → C → D is better than path S → A → C → D, which matches the analysis above. Thus, CDE can describe the actual channel distribution along paths. We evaluate the performance of MIL with that of MIC, INX, and CATT using NS-2, and the support for multiple channels and multiple interfaces per node is added to the simulator. We also modify NS to support physical interference model. The performance metrics, simulation results, and analysis are given in the following subsections. Throughput per flow. The throughput per flow is the average data bits that are successfully received by each flow receiver per unit time. Average packet loss ratio. The average packet loss ratio is the number of packets received unsuccessfully by all receivers versus the total number of packets sent out by all senders. Average end-to-end delay. The end-to-end delay is the time between sending out a packet and successfully receiving it. The average taken over all the successfully received packets is the average end-to-end delay. WMNs are usually deployed after carefully planned, and the regular topology can average the performance over the whole networks . We simulate small WMNs of 7 × 7 squared grids over 1,500 m × 1,500 m area with side length of 250 m, that is, each vertex is deployed with a mesh router, and each edge denotes a wireless link. We use 802.11b at the physical layer with transmission rate of 2 Mbps and the interference range is 550 m. The constant bit rate (CBR) traffic sources are used. Packets have a size of 512 bytes and are sent out at deterministic rate. In this paper, we use sending rate and load interchangeably, since larger sending rate yields heavier load for the networks. The above simulation parameters are summarized in Table 1.Flows including sources and destinations were predefined in the network so that they can intersect and consequently interfere with each other. The number of flows varies between 6 and 8. For different number of flows, we measure the throughput per flow, average packet loss ratio, and average end-to-end delay as functions of the sender’s sending rate, and vary the sender’s sending rate from 512 to 1,024 kbps to yield moderate and heavy load for the given size network. Figure 6 shows the results for the 7-flow scenario. Performances versus load for 7-flow scenario. (a) Throughput per flow comparison. (b) Average packet loss ratio comparison. (c) Average end-to-end delay comparison. 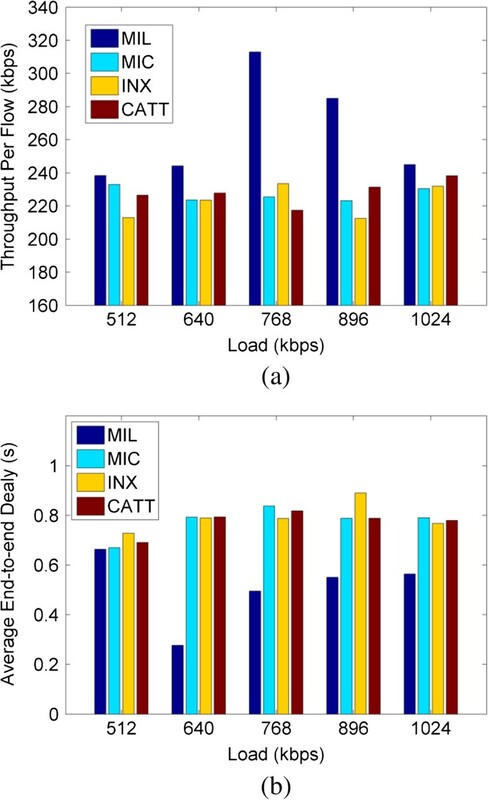 Figure 6a shows that CATT performs better than MIC and INX in terms of throughput per flow, because MIC and INX both use active probing technology to acquire delivery ratio and available bandwidth, and these probing packets may collide with data packets and result in packet loss. CATT utilizes neighbor count to measure interference, which can avoid the overhead introduced by probing packets. Generally, MIC performs better than INX, since MIC uses normalization function to smooth the ETT values and help offset the inaccuracy of link quality estimation to certain extent. MIL offers the highest throughput per flow, about 27.50%, 36.03%, and 40.50% higher than CATT, MIC, and INX, respectively, when the network load is 768 kbps, as shown in Table 2. The performance gaps between MIL and the remaining routing metrics are larger when the network load goes to 896 kbps. The performance improvement all results from the fact that MIL considers both the physical interference and the logical interference, i.e., in more realistic way. MIL also takes queuing length into account to determine congestion areas in the network, so MIL can help avoid heavy load and heavy interference areas. More packets can be routed to the destinations, so that the throughput per flow is improved.Figure 6b gives the performance comparisons among these routing metrics with respect to the average packet loss ratio, which matches Figure 6a. Again, MIL performs the best, that is, MIL is more powerful in delivering packets correctly. The lower the average packet loss ratio is, the more packets are delivered, so network throughput will be higher. Average packet loss ratio and network throughput are complementary to each other, and their relationship has been proven by the results above. Due to the complementary relation, the analysis of average packet loss ratio is omitted in the following simulations. As shown in Figure 6c, the average end-to-end delay mainly tends to increase as the network load increases; because more packets will be injected into the network when load increases, packets need to wait in the buffer queue, so the queuing delay may become longer, which contributes to the end-to-end delay. Delay caused by retransmissions is not included, as average end-to-end delay aims at packets received successfully. Due to the capability of detecting and avoiding heavy load and heavy interference areas, packets that use MIL to select paths can be transmitted with the lowest average end-to-end delay. The performance gains of MIL are shown in Table 2.Next, we vary the number of simultaneous flows in the network to 8 and 6, respectively, and measure the network performances. The results are shown in Figures 7 and 8, from which we can claim similar conclusions. Performances versus load for 8-flow scenario. (a) Throughput per flow comparison. (b) Average end-to-end delay comparison. Performances versus load for 6-flow scenario. (a) Throughput per flow comparison. (b) Average end-to-end delay comparison. Still, MIL yields the best performance, with respect to the throughput per flow and average end-to-end delay. These results demonstrate that MIL works well in moderate and heavy load condition with multiple parallel flows, which is usually the case in practice. We give a simple comparison of the throughput per flow with 8 flows in the network (see Table 3 for details). We also evaluate our MIL routing metric in random topology. The following method is used to generate random topology: A square region with the area of 1,500 m × 1,500 m is specified first which has the width [0, 1,500] on the x axis and the height of [0, 1,500] on the y axis. Then, 49 nodes are generated and the position (x,y) of each node is randomly specified within the square area. If the distance between two nodes falls into the transmission range, we add a link between them. Finally, we check whether the generated topology is connected or not. If not, the above process is repeated until the network connectivity is satisfied. We compare the performance of MIL with CATT, MIC, and INX based on throughput per flow, average packet loss ratio, and average end-to-end delay in 7-flow scenario. Figure 9 summarizes the results obtained. Performances comparisons for 7-flow scenario in random topology. (a) Throughput per flow comparison. (b) Average packet loss ratio comparison. (c) Average end-to-end delay comparison. 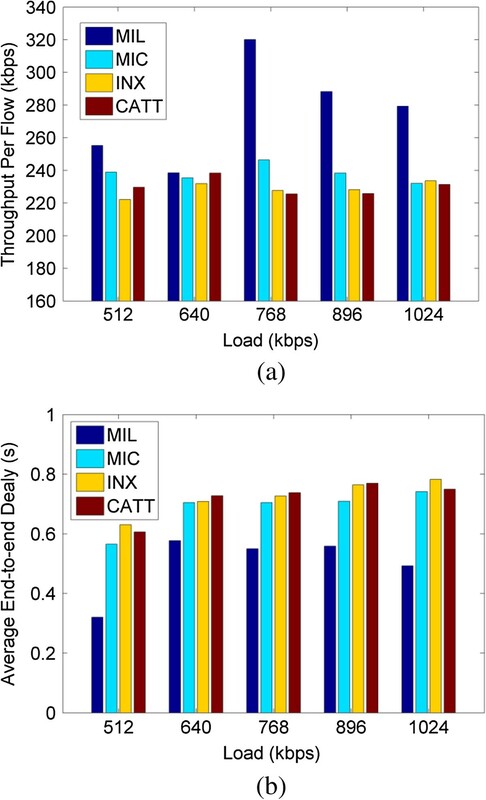 Similar as in grid topology, MIL can result in better throughput per flow performance than other metrics, about 50.75%, 51.55%, and 51.50% higher than CATT, MIC, and INX, respectively, when the network load is 896 kbps. MIL has lower average packet loss ratio and average end-to-end delay; the reason is that MIL considers physical interference, logical interference, and load comprehensively, which can help detect congested areas and avoid routing packets into these areas. As in the analysis above, MIL can identify heavy load and heavy interference areas in the network; packets are routed through low interference and lightly loaded path, which can lead to less packet loss, shorter end-to-end delay, that is, more packets can reach destinations more quickly and more accurately, and thus, the network performance is improved. In this paper, we research on the problem of routing metrics for MRMC WMNs. On the basis of analyzing limitations of current routing metrics, a routing metric based on uniform description of interference and load MIL is proposed, and the innovativeness of MIL includes the following: (1) isotonicity requirement is satisfied, so optimal paths can be found by efficient algorithms such as Bellman-Ford or Dijkstra’s algorithm; (2) physical interference, logical inter-flow interference, and logical intra-flow interference are uniformly described while designing MIL routing metric, which helps avoid complicated design of routing metric or introduction of adjustable parameters; and (3) load balancing is achieved, which helps avoid the creation of bottleneck nodes or congestion. NS-2 simulations under different load demonstrate its capability of detecting and avoiding heavy load and heavy interference areas, and network performances including throughput per flow, average packet loss ratio, and average end-to-end delay are dramatically improved. MIL is proposed under the assumption that channels are orthogonal. The number of orthogonal channels is very limited in 802.11b/g WMNs, and partially overlapped channels have been proven to be helpful in increasing throughput, decreasing end-to-end delay and so on [28, 29]. Our future work is to extend MIL routing metric into WMNs using partially overlapped channels. This work was supported by the National Natural Science Foundation of China under Grant No. 61373124.